Since the dawn of time, the Pays d’Olonne has been occupied by man. This is evidenced by the many remains discovered in the Vendée region. Originally, the sea covered a large part of the land and ‘Ol-ona’, meaning ‘Hill above the water’, is thought to be of Celtic origin giving its name to 4 of the 6 communes which make up the region. Thanks to its tiny harbour, Olonne became a major crossroads in the Roman Empire, (‘Le Havre d’Olonne’ nestled in a bay sheltered by the long island of Vertime – the present Côte Sauvage and forest of Olonne). The salt marshes and vineyards of Ile d’Olonne were probably created at this time and have played a large part in providing the region’s wealth for up to 2000 years. The land was ravaged by invaders between the fifth and ninth centuries and was occupied by the Normans eventually until the 10th century. Then, in the 12th century, the marriage of Eleanor of Aquitaine to Henry II Plantagenet, meant that the region passed under English rule for more than 50 years. 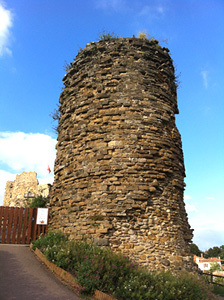 The castle at Talmont became the favourite residence of their second son: Richard the Lionheart and the land of Orbestier his favourite hunting ground. In the Middle Ages, the land witnessed an enormous economic boom presided over by the lords of Olonne. This in turn gave rise to a fabulous religious heritage. During the Revolution, the region supported Republicans (there were at least six prisons in Les Sables d’Olonne, including one guillotine and a revolutionary court). Under the Empire, the town was constantly faced with the threat of English warships. During the 18th century Les Sables d’Olonne went somewhat into decline, which was only to end with the rise of fishing and tourism in the late 19th century. In 1845, the harbour was modernised and sardine and tuna fishing ensured the growing success of the canning companies (‘confiseries’). In terms of tourism it was not until 1825 that the first thermal baths and bathing machines appeared and as a result, Les Sables d’Olonne The beach at Les Sables d’Olonnebecame a sophisticated resort much frequented by the aristocracy and artistic elite.in this environment it was natural for the town to build its first casino, the ‘Casino des Bains de Mer’ (now the ‘Casino des Atlantes’). This truly was the Belle Epoque for Les Sables and the new railway which arrived in 1866 connected Paris to the ‘finest beach in Europe’. Sea Bathing became extremely fashionable and in 1898 second casino sprang up: the ‘Casino des Pins. A thalassatherapy centre was added in 1989 and a conference centre in 1998. 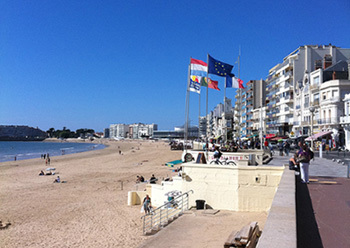 The beach at Les Sables d’Olonne is ideal for families as it shelves very gently and the sands are very well cared for by the local community. On warm summer evenings, the beachfront promenade which the locals call ‘Le Remblai’ will be awash with street performers entertaining tourists in front of the pavement cafes. Be warned that during the peak tourist times of the year, parking can be extremely difficult on the busy seafront. Les Sables d’Olonne is also the home of the internationally renowned “Vendée Globe” which is without doubt the world’s most prestigious single handed round the world race held every 4 years. 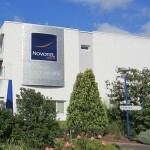 During the month before the race takes place, the Vendée globe village is open to the public. This is a delightful and interesting museum/gallery of modern Art and is located in a wing of the 17th century former Benedictine convent.